Who can I reach by advertising on Webportal.com.my? 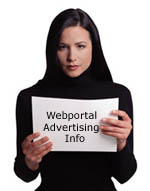 Webportal.com.my's wide range of interests & ability to reach a well diversed market is reflected by the wide demographic profile of members registered with the site. This makes the site an attractive prospect for marketers in almost every category. Webportal.com.my users represent the most unique marketing opportunity available. Our users are well educated, wealthy, and they actively use the internet to purchase regularly. We welcome you the opportunity to introduce your products to our ever expanding user base (currently at 99095 registered members) and to brand your message to them & millions of other people online. We believe in providing our members with the best offers available on the internet, so do us and our members a favour, Contact Us today!